EBS Classic 500 bass amp debut at the Bass Player Live event. 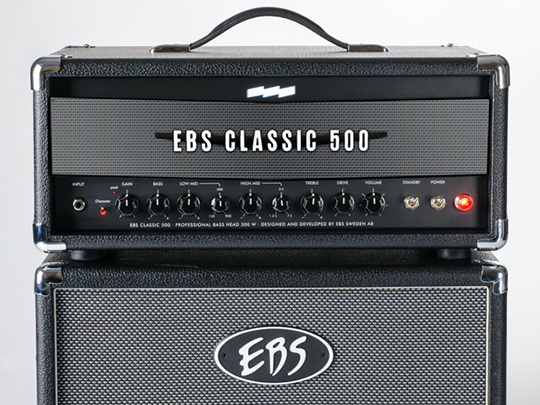 The EBS Classic 500 is the natural evolution of the previous EBS Classic 450 bass head. The extra power and the new compact casing bring flexibility and portability to the table. This is a very capable bass head with a stunning look. The amp will be showcased internationally for the first time at the Bass Player Live event in Hollywood on November 9-10, although it was spotted at a local show in Stockholm already at the beginning of October 2013. The new EBS Classic 500 retro-styled bass amp offers a classic tube amp-type of sound although it is a solid state bass head. The musical boosted Drive control and the exceptional control offered by the dual midrange section makes it easy to dial-in any type of vintage (or modern) bass sound. The plenty of power offered from the new power amp makes the Classic 500 an amazingly versatile bass amp with a beautiful tone. Transparent to the character of your bass – in true EBS tradition! The thoughtfully designed EQ puts you firmly in the driving seat adding everything from subtle, vintage overdrive to a mean driving distortion, whilst maintaining a beautiful low rounded bottom end. The perfect match for EBS ClassicLine cabinets. With the new compact design, the Classic 500 is the perfect match for ALL EBS ClassicLine cabinets, including the narrower mini size 112 cabinets. The new design also works fine with the ProLine and NeoLine cabinets. The new design fit’s the width of the mini size EBS ClassicLine 112, as seen in the picture. – New cabinet design matches ALL cabinets of the ClassicLine. – Also works with ProLine or NeoLine cabinets. The back panel of the EBS Classic 500. The EBS Classic 500 start shipping in December. This entry was posted in EBS Sweden AB - Press Center and tagged 500, amp, bass, classic, EBS, solid state on November 6, 2013 by ebssweden.